Uh-oh… it’s that sinking feeling you get when you realize your AC isn’t working. Maybe you’re not getting cold air, or maybe your AC isn’t running at all. We know those scenarios are the worst—especially in the middle of summer when you depend on your AC the most. Luckily, as a homeowner, you can take some steps to try and fix your AC before you call a pro. Note: If you ever notice excessive water coming from the indoor unit or you hear strange noises you should skip these tips and call a professional immediately. If you try these DIY tips but can’t fix the issue, then call a professional for help. The first thing you should always check when you’re having an AC issue is the thermostat. Why? Well, your thermostat is like the “brain” of the whole system. If it’s not working correctly, or if it is set to an incorrect setting, then your air conditioner won’t perform well (or at all). Make sure you can see the screen (if you have a digital model). If you can’t, you may need to replace the batteries. If you can see the screen, verify that the thermostat is set to COOL, not OFF or HEAT. Check the desired temperature to make sure it’s set at least 5° F below the room temperature. Sometimes air conditioners (especially older ones) will pull in a large amount of electrical current at start-up, which could trip the circuit breaker and prevent your AC from turning on. Go to your electrical panel and check the AC breaker. If it is “tripped” flip it back to the “ON” position. Note: If the circuit breaker continues to trip, don’t keep resetting it—call a professional to fix whatever is causing the circuit breaker to trip. Make sure your thermostat is set to AUTO and not ON. In the ON setting, your AC fan will run non-stop—even when your AC system isn’t cooling your home’s air. When your thermostat is set to ON, you may notice that the air coming from your vents isn’t as cold. On the other hand, when you set your thermostat to AUTO, your AC fan will only run while your system is cooling air. Learn more about these thermostat setting by reading our article, ON vs AUTO: One of These Thermostat Settings Costs You Money. Believe it or not, your air filter may be what’s preventing your air conditioner from blowing cold air into your home. You see, if your air filter is dirty, it acts as a barrier that blocks air from entering your system to be cooled. When your AC isn’t getting enough air, it limits the cold air that it can push back into your home. If your filter looks dirty like the one on the right, change it. During the summer we recommend checking your filter every month and replacing it when it’s dirty. 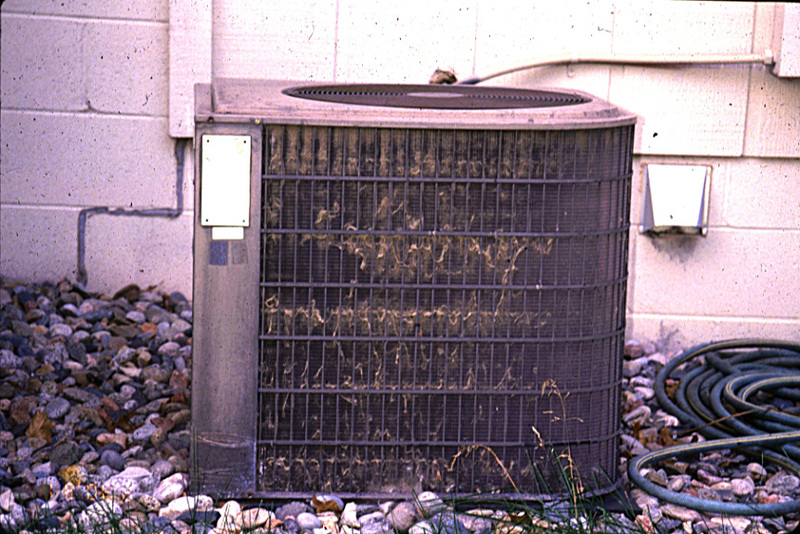 The AC condenser coils (pictured below) are located in the outdoor unit. The purpose of the condenser coils is to dump out the heat that the refrigerant collects from your home’s warm air. You can think of your AC system as a sponge: it absorbs heat and then dumps it out via the condenser coils. However, if the condenser coils are dirty or blocked by shrubbery, then it creates a barrier that makes it harder to release that heat, which makes it harder for your AC system to cool your home’s air. Do this: Clear any grass, leaves or sticks that are covering the coils. You may also needs to trim nearby plants so that there is at least 3 feet of space surrounding the outdoor unit. If you notice that the condenser coils are covered in a thick layer of dust, contact a professional to clean them for you. During an annual maintenance visit, a professional will clean your AC and check for potential problems to prevent expensive AC repairs and breakdowns. Need to schedule your AC maintenance?